Instructions For The Instant Clean Detox Program. These instructions are to guide you through the Instant Clean Detox Program. The Instant Clean Program Will Clean Your Urine and Your Blood. You will be free of all prescription drugs, non-prescription drugs, caffeine residue, nicotine, unhealthy food deposits and/or any environmental contaminates for that period of time. For how long you will be free, see “Being In The Detoxify Zone” later in the article. 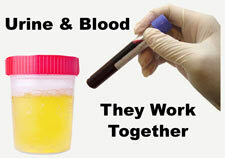 Urine And Blood Work Together. Either Both Are Clean Or Neither Is Clean. Your blood and urine systems are tightly tied together. Toxins in your blood are flushed out of your body through your urinary tract. If your urine is free of toxins, your blood will be free of toxins . If You Are On Prescribed Medications, Please Be Careful. Instant Clean really works. If you are on a prescribed medication, Instant Clean will flush all your prescription medication from you body for a period of time. If you are on prescribed medications do not use Instant Clean unless you have consulted your prescribing doctor. The Instant Clean Detox Program Is Only For Urine And Blood. To Clean Your Hair. The Instant Clean Detox Program will not clean your hair. To clean your hair you must use Ultra Clean Shampoo. To Clean Your Saliva. The Instant Clean Detox Program will not clean your saliva. To clean your hair you must use Ultra Wash Mouthwash. What It Takes To Detoxify Your Body. Watch this short video on what it takes to detoxify your body. It is important you know the detoxification process before you start the Instant Clean Detox Program. Take the time to watch this video. It will only take a few minutes. Our Instant Clean Detox Program Instructions must be followed exactly to meet your personal goals. This is science, not product marketing. The closer you follow the guidelines, the better your results. You Are The Key Factor In Your Detox Program. There are a myriad of factors that can affect the outcome of ones detoxification program. Many of these factors have absolutely nothing to do with the effectiveness of Instant Clean. Your implementation of the detox program is totally our of our control. Do your part. Follow our advice. Get the results you need. Five Easy Steps To Verified Detoxification. Watch The Short Instructional Video. Test Your Self To Make Sure You Have Maximized Your Detoxification. The Detoxification Zone Is The Window In Which Your Urine Will Be Free From All Toxins. Using the Instant Clean will allow you to be free from all toxins with in a very specific window in time. Outside that window you will again become toxic. This window of opportunity is called the Detoxification Window or being in The Detoxification Zone. The Detoxification Zone has a starting point when you are completely detoxified and an ending point where your body will again become toxic. Everyone’s Detoxification Zone is a bit different. But the variations are not usually significant if you follow our instructions exactly. The Detoxification Zone Time Frame. 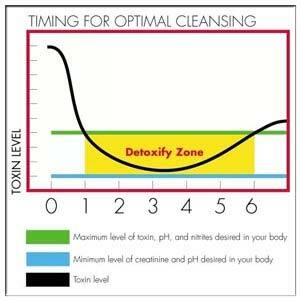 You will be in your detoxification zone starting 1 hour after you finish your Instant Clean Detox Program. This window lasts for the next five hours. Remember: The Detoxification Zone ends 6 hours after you use Instant Clean. You will not be free from all toxins for the first hour after using Instant Clean. Remember, this is free not only from all toxins , but also from all prescription drugs, non-prescription drugs, caffeine residue, nicotine, unhealthy food deposits and/or any environmental contaminates while you are in your Detoxification zone. Need More Time? Optionally, you may extend your Detoxification Zone window for an additional 2 or 4 hours by sipping 20 oz. of water over each hour for the next 2 or 4 hours. That would extend the Detoxification Zone for up to 7 or 9 hours in total. Step 2 – Instructional Video For Instant Clean. You will notice some slight difference in the packaging of Instant Clean. The box you have might look a bit different from the box in the video. Don’t worry. This is just new packaging. Everything on the inside is the same. Step 3 – Instant Clean From Detoxify Use Instructions. These are the same instructions as the above video instructions for Instant Clean From Detoxify . Some people like a video. Some people like to read the textual instructions. You choose your flavor. With Instant Clean you are just (3) capsules and a few glasses of water away from being free of nicotine. If You Are On Prescribed Medications, Please Be Careful. 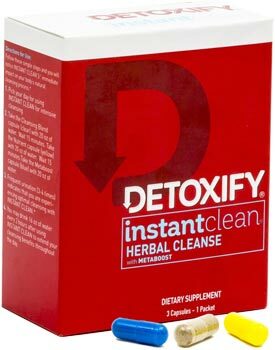 Instant Clean From Detoxify really works. If you are on a prescribed medication, Instant Clean From Detoxify will flush all your prescription medication from you body for a period of time. If you are on prescribed medications do not use Instant Clean From Detoxify unless you have consulted your prescribing doctor. Take the Cleansing Blend Capsule (clear) with 20 oz. of water. Wait 15 minutes. Take the Nutrient Capsule (yellow) with 20 oz. of water. Wait 15 minutes. Take the Metaboost Capsule (blue) with 20 oz. of water. Urinate frequently. Usually starting in about 15 minutes. Urinating 2 – 3 times indicates that you are experiencing optimal cleansing with Instant Clean. Instant Clean is now protecting you for up to 6 Hours after starting your Instant Clean program. Optionally, you may extend your Detoxification Zone window for an additional 2 or 4 hours by sipping 20 oz. of water over each hour for the next 2 or 4 hours. That would extend the Detoxification Zone for up to 7 or 9 hours in total. Step 4 – RU Clean Instructions. RU Clean 12 Urine Tests Are Professional Grade. We are really not supposed to sell these forensic urine tests to the general public. You will see in the documentation they are for forensic use only. 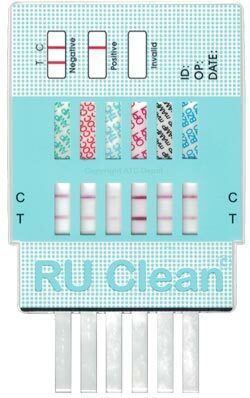 RU Clean 6 Tests are the same CLIA Waived Drug Tests you will be facing at your screening. RU Clean’s are not the cheap ones you typically find on the internet, Walmart or in your local store. 99% Accuracy – Same As Tests Used By Professionals. Self Testing Is Confidential And Anonymous. What Can RU Clean 12 Find? Let’s Face It. Most people on a detoxification program are most concerned with cleaning out various drugs and/or from their system. This might include prescription medications, recreational drugs and/or many non-prescription medications. Many illegal drugs are available in prescription medications. This is a subject that is much to complex for this article. AS you can see from the list of drugs below, many common prescription drugs contain components that are derived from drugs that are illegal to own. The RU Clean 12 is the top of the line detection device. the RU Clean 12 can find all of the most common drugs in your system. It can also tell you there are not any of these drugs in your system. 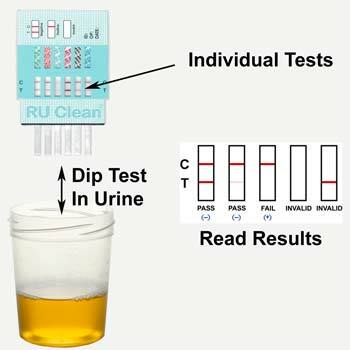 The RU Clean 12 Drug Urine Test. You can be toxic for one drug and not toxic for another. The RU Clean 12 Drug Urine Test is read from the front and back. There are 6 independent tests on the front of the test and another 6 independent 6 tests on the back of the test. The RU Clean 12 can not only detect the target drug, but can detect any prescription or over the counter medication that contains any amount of the target drug. Instructions For The Use Of RU Clean 12. Let the RU Clean Test reach room temperature. Take the RU Clean Test out of the wrapper. Set on a flat surface. How To Read RU Clean Test Results. Pass – Two colored bands will appear, one in the control area (C) and one in the testing area (T). This negative (passing) result indicates that toxins are either absent or less than the detection level of the examination. Pass Marginal – Any faint line in the (T) could indicate that the toxin in the sample could be near the cut-off level for this urine drug test. However, any line in the (T), no matter how faint, should be interpreted as a negative (passing) result. Fail – Only one colored band appears in the (C) with no apparent band in the (T). This is a positive (failing) result. A positive (failing) result indicates that the toxin is present in the at or exceeding the detection level of the examination. Invalid – No band appears in the (C), or a band appears in the (T). An invalid result may be due to improper procedures or damage of the device. The RU Clean Test is inconclusive and your specimen should be repeated using a new RU Clean Test. Time Fault – If the urine test is left standing for longer than 10 minutes, the intensity of the colored lines may change and or for technical reasons, a faint line may appear in the (T) that should not be interpreted. No conclusion should be drawn from a Time Fault RU Clean Test.